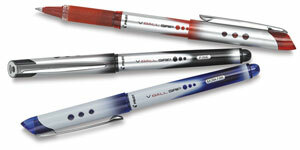 This pen has a sleek, stylish metallic barrel, paired with a rubber comfort grip that provides writing control. Its advanced ink system with a large supply of liquid ink guarantees smooth, skip-free writing. The ink supply is also visible. ® Pilot is a registered trademark.® V-Ball is a registered trademark.